What a great problem to have! No, really – it can be a problem. Last week, I was at Target HQ to present a line that recently launched in market. How they were invited to Target for a line review is actually a crazy story. They launched in Spring 2014 at a trade show at which a Target buyer stopped by their booth and collected information. Fast forward a couple months later, out of the blue, they received a call from (a different) Target buyer inviting them to Minneapolis to present their line for consideration for the 2015 assortment. Let me be clear. This rarely happens. So what does a new brand do when a huge retailer is knocking on their door? I’ll answer that in a second. Get a new manufacturer who could handle Target volume and do so with short order lead times. Get a new warehouse, fulfillment, logistics and distribution system set up without any shipment history to base price quotes on. And get those costs down to meet Target’s margin requirements. Get an expert in supply chain and inventory management on staff to manage operations. $$$$ to: fund these large inventory orders, pay for all supply chain partners, fund their marketing plan, and to hire their supply chain expert. And after all that, their profit margins were shockingly slim. All of a sudden, selling to Target sounded like a scary and financially risky idea to my clients. And this is why it is rarely good to sell to a large retailer immediately. In fact, not only does it behoove brands to hold off on big retail, but to scale up smartly, slowly, and be choosy about which retailers you sell to and when. Retailers that will give you sales history, which is the “currency” needed to sell to larger retailers. Retailers that are within range of your infrastructure and operational capabilities. Key accounts are retailers that hit the sweet spot between the above two categories. I’m simplifying things here for the blog. 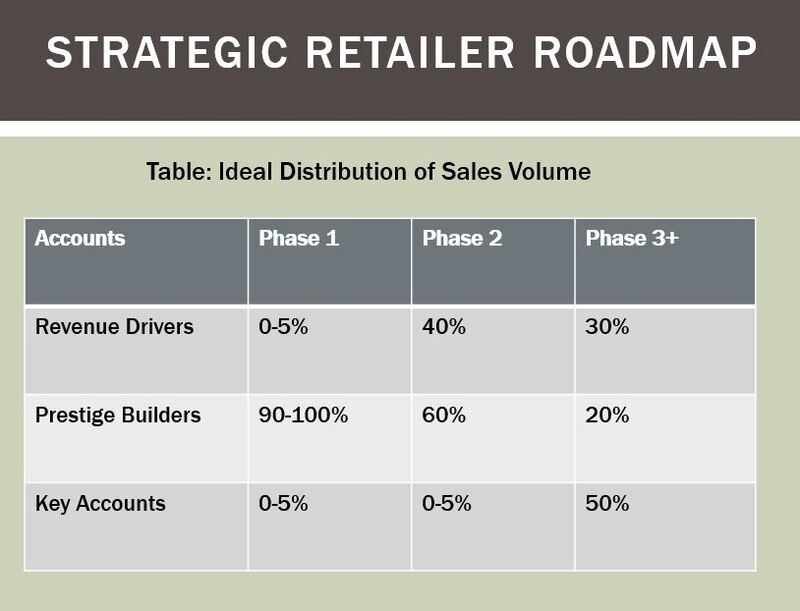 In reality, the Strategic Retailer Roadmap has more facets to it. But each brand needs to identify the right level of penetration within each Account Type for each stage of growth (e.g., Phase 1, Phase 2, etc). I create these Strategic Retailer Roadmaps for clients who are getting tons of calls from retailers but don’t know how to prioritize them or for brands trying to decide which retailers to go after first. It has helped provide them with clarity, has broken the growth stage into smaller digestible steps, and minimized the feelings of overwhelm. Example of a brand’s growth plan. These numbers are for illustrative purposes only and do not apply to all brands. So brands, if there is a takeaway from this blog post, let it be this: Build a plan for how you will grow your retail distribution and reference it often. When a retailer calls, see where they fit in the plan and do the math to see if you can handle the financial risk of taking on that account. And do NOT be afraid to say no. Ultimately, saying “no” is the defining difference between smart profitable companies and companies that seem like “overnight successes” but then crash and burn. Which one will you be? Previous Post From the Entrepreneur’s Perspective: I have all these retailers who want my product line. How do I prioritize? Next Post From the Entrepreneur’s Perspective: Do retailers want me to do a show like “Shark Tank”? Thanks for this post Vanessa- as always, your experience shines through these words of wisdom. As a growing brand it’s hard to be objective about opportunities and whether you are ready for them. Having the permission to say no, or at least , not yet, takes faith and courage. But the alternative of crash and burn is also all too real. Laying out a framework to stay the course is immensely helpful. Do tell though – did your client decide to go for it? Thanks, Catherine, for reading and your nice words! Did my client decide to go for it? Well, we were invited to the line review so we had to show up. But what we presented to the buyer was a realistic picture of our current capabilities, our plan for how to scale up for Target and the risks associated. Plus a plan for how to mitigate those risks. It only hurts us to over promise and under deliver. Truthfully it doesn’t make sense for Target or this brand to join the Target assortment in 2015 for many reasons, but our goal was not necessarily to get on shelf in 2015. Our goal was to establish a strong and positive impression with the buyer, demonstrate the opportunity, update her periodically on our successes and growth – and when we have more history on our side, then ask for a store test or permanent shelf placement.